The hilltop city of Perugia, the capital of the region of Umbria in central Italy, may boast the greatest medieval palace in Italy, the finest art gallery in the region, and ancient fortified walls and gates, but its many dark and twisting cobbled alleyways, back streets, arches and winding staircases offer many other surprises for the inquisitive tourist. 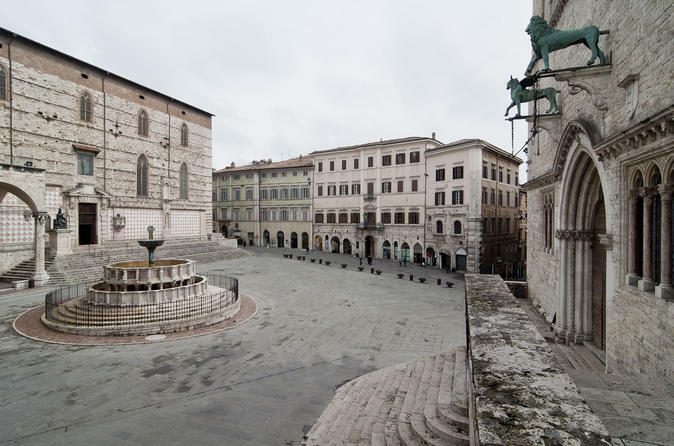 One of Perugia’s most photographed locations: the main square of Perugia with the Maggiore fountain in the centre. On the left is the side of the C14 Cathedral (or Duomo) of San Lorenzo. Immediately on the right is the entrance to the Palazzo dei Priori (the meeting place of the priori or ‘first citizens’ of Perugia’s medieval commune) surmounted by the city’s symbols, the griffin and the lion. Perugia was amongst the most important of the twelve city states of Etruria, the dominant culture of Italy until the Roman Republic was established in 509BC. Though the Etruscans were assimilated into Roman culture, the city has many Etruscan landmarks including the innermost massive walls of the city with its seven gates that were constructed in the second half of the 3rd century BC. In the heart of the city is the masterpiece of Perugia, the C13 richly sculptured Fontana Maggiore in one of Italy’s finest piazzas, the Piazza IV Novembre (the day the First World War ended in Italy). Facing the square is the medieval Palazzo dei Priori, one of Italy’s greatest public palaces, which also houses the Galleria Nazionale dell’Umbria and the region’s finest collection of Umbrian art. Further out from the Etruscan walls, another series of walls and four gates was built in the C13 and C14. Curiously evidence of Roman rule is scare. There are Roman remains beneath the cathedral, and also beneath the Tempio di Sant’Angelo at the end of Corso Garibaldi to the north of the city. This unusual circular building, which is a paleo-Christian temple from the C5-C6, is one of the most ancient churches in Italy. It has some Romanesque features and is built on the remains of a Roman temple. The aqueduct on the west side of the city is Medieval not Roman as is sometimes stated. Today, Perugia is also famous for its international chocolate and jazz festivals, its football team, its cosmopolitan L’Università per Stranieri di Perugia (the University for Foreigners) established by the fascist dictator Mussolini in 1921, and home to the country’s largest language school. If you’ve only 48 hours in Perugia, here’s an assortment of other places to see and things to do. At the southern end of the main street of the city, the broad Curso Vannucci, past the Piazza Italia, under the western porticoes of the Prefecture Palace of Perugia, is an escalator. This unexpectedly takes you down into an underground complex of passages and vaults. This is all that remains of a great papal stone fortress, the Rocca Paolina (the Pauline Fortress), commissioned by Pope Paul III in 1540 following the brutal putting down of a revolt by the city. Perugia had enjoyed a degree of autonomy from the Papal States that had ruled central Italy from the 8th century. The revolt was triggered by the Pope’s decision to enforce a tax on salt which violated treaties between Perugia and previous popes. The conflict became known as the Salt War. 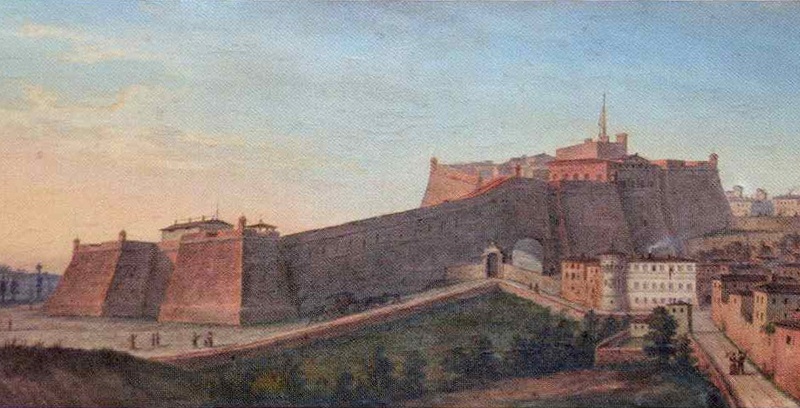 This C19 painting by Giuseppe Rossi shows Perugia encircled by its walls with the Rocca Paolina in the foreground as it must have looked after its completion in C16. This was before the destruction of the fortress in 1860, when the buildings were demolished leaving intact the irregularly shaped ramparts or bastion underneath. To build the fortress, hundreds of houses, including the palaces of the Baglioni family, the brutal rulers of Perugia since 1488 and enemies of Pope Paul, were demolished. The huge fortress became a symbol of church supremacy and oppression that lasted for three centuries. With the unification of Italy in 1860 the top-level of the fortress was demolished using dynamite and bare hands and the Prefecture Palace and the Carducci Gardens were built on top. This left the bastion and ground floor of the fortress as underground galleries. Anthony Trollope, watching the demolition, wrote that ‘few buildings have been laden with a heavier amount of long-accumulated hatred’. The underground streets of the Rocca Paolina (left and centre) and the 3rd century Etruscan gate, Porta Marzia (right), that was incorporated into the external walls of the fortress when it was built in 1540. The portal leads into the underground streets of the Rocca Paolina. Three successive escalators continue down through the underground city, into the open in the shadow of the ancient walls, and arrive at a bus station and car parks in the newer city. The National Trust has a target of producing 50% of its energy from renewable sources on its land by 2020. It’s a challenging target. The new biomass boiler which was installed at Ickworth Park near Bury St Edmunds in Suffolk and which was switched on in July 2015, is one of five pilot renewable energy projects that will address that goal. This is the story of how trees on the 1,800 acres estate are being turned into fuel. 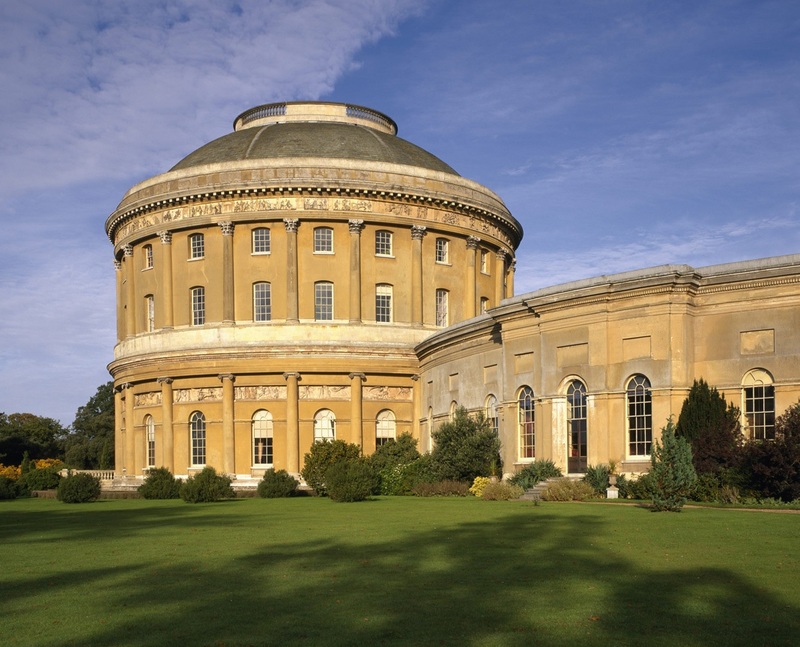 Completed in 1829, the Rotunda was later described by architectural historian Nikolaus Pevsner as ‘a crazy idea … it makes for a lumpy appearance outside and creates very unsatisfactory shapes for rooms inside’. More recently architectural commentator Gervase Jackson-Stops said the Rotunda was like a ‘huge bulk, newly arrived from another planet’ and an ‘overgrown folly’. The 199kw boiler is fuelled by wood chip produced from timber taken from the 600 acres of woodland on the estate and it will supply 100% of the fuel for heating the Rotunda and the West Wing. These are the main buildings in the centre of the park, and were the idea of the 4th Earl of Bristol, Frederick Augustus Hervey, who intended to use them as a place to display the treasures he gathered during his 30 years of travel in Europe. The Earl was seen more in Italy than in Suffolk. Incidentally the Hervey family became more eccentric and more notorious right up to the 20th century; read more here. But ever since Ickworth was passed to the Trust in lieu of death duties following the death in 1951 of the 4th Marquess (and 8th Earl) , the buildings have been a nightmare to heat and the bills for the heating oil have been enormous. Around 156 tonnes of wood chip fuel would be needed each year in addition to the 40 tonnes that was currently being supplied to the boiler at the Regional Office of the Trust at Westley Bottom a mile away. An independent assessment concluded that extracting this amount from the estate on rotation would be sustainable. Removal of timber from the estate first started in autumn 2014 when ‘harvesting’ machines extracted non-native softwood trees like Western Red Cedar, Norway Spruce and Larch, from a small area of Lownde Wood in the south of the estate. The logs had to be stacked nearby as the wood chip store still had to be built. This was to be located next to the existing wood store in the north of the estate. In September last year, harvesting of softwood resumed in Lady Katherine’s Wood on the east side of the estate (photos 1 & 2). The harvester cuts the tree at its base, and as the trunk is lifted up, it is fed through rollers. Knives strip the branches off the trunk, and a chain saw cuts the trunk into 12′ lengths. This all seems to happen in just a few seconds and it is fascinating to watch. These plantations of softwood were likely planted forty or fifty years ago but they had not been managed for a long time. Not all of the softwood is cleared, no more than 30% of the canopy in fact (photo 3). This is to keep some cover for wildlife until the wood is replanted with native broadleaf species that will improve biodiversity. It also serves to protect the wood from strong winds which could blow down thinly spread trees. Standing and fallen deadwood is left, again for the benefit of wildlife. The land for the wood chip store had by this time been cleared so all the timber, including that from Lownde Wood, was taken up to wood store in the north of the estate (photos 4) where it was piled into five long stacks (photo 5), enough timber to last Ickworth’s needs for an estimated three and a half years. Ideally the timber needs to be stacked for 18 months to 2 years to dry out before it is chipped. On Monday, Sir David Higgins, produced his review of the high-speed train project, HS2, which included the ambitious proposal to completely rebuild Euston railway station in London, and at the same time maximising the commercial opportunities. The original redevelopment plans for the station had been downgraded last year, but in February this year, Chancellor George Osborne came out in favour of the complete redevelopment of the station and surrounding area which would lead to the creation of more jobs, and more houses being built. Transport Secretary Patrick McLoughlin in responding to the Higgins report agreed, saying that he will ask HS2 Ltd and Network Rail to work up ‘more comprehensive proposals for the development of Euston’, but added that ‘this work should include proposals for the Euston arch which should never have been knocked down and which I would like to see rebuilt’. What was the Euston Arch? The Entrance to the London Passenger Station opening immediately upon what will necessarily become the Grand Avenue for travelling between the Metropolis and the midland and northern parts of the Kingdom … should receive some architectural embellishment. They adopted accordingly a design of Mr Hardwick’s for a grand but simple portico, which they considered well adapted to the national character of the undertaking. Hardwick’s arch, completed in May 1837 at a cost of £35,000, was huge, 70 feet high, and was the first great building of the railway age. It was built using Yorkshire gritstone, in the Doric style with the arch also supported by four 8 foot 6 inch-diameter columns and four piers, with bronze gates placed behind them. Gatehouses were also built on either side. The arch, which architects would call a propylaeum (‘the entrance before the gate’ to a sacred place in Ancient Greece), complemented the Ionic entrance, which still stands, to the Curzon Street Station in Birmingham at the other end of the new railway line. 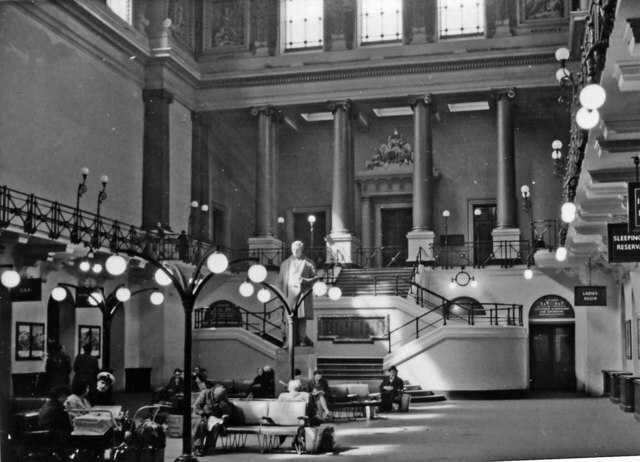 The Great Hall in Euston Station completed in 1846, served as a very grand waiting room. 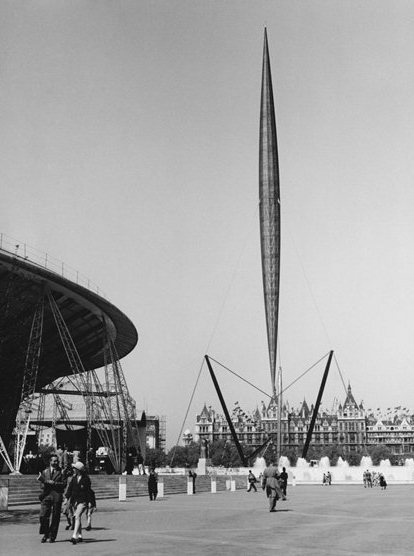 This photo was taken in 1960 and being a Sunday there are relatively few people around. The staircase leads to the gallery and shareholders’ room, past the 1852 statue of George Stephenson. Tickets were bought from hatches in nearby passageways. In 1849, in order to cope with the increasing number of passengers, Hardwick’s son, Philip Charles Hardwick designed a magnificent waiting room, the Great Hall. This was built in the Italianate Renaissance style, and was 126 feet long, 61 feet wide and 64 feet high, with a coffered ceiling and a sweeping double flight of stairs leading to offices at the northern end of the hall. The early station was set a long way back from Euston Road and the arch faced Drummond Street that ran east-west through the area, though only the western end of the street going towards Hampstead Road remains today. For many years there was nothing on the arch to say that it was the entrance to the station, but in 1870 the London and North Western Railway Company inscribed ‘EUSTON’ on the architrave in letters of gold. A road was also created for the first time from Euston Road to the portico. By the end of the 1950s, the station was considered to be poorly located and impracticably small, and at odds with the British Transport Commission’s (BTC) plans to upgrade and electrify the main line between Euston and Scotland as part of its Modernisation Programme. 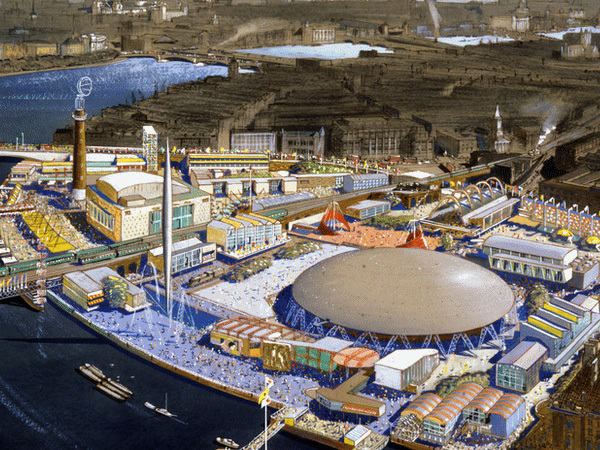 In January 1960 the BTC served notice on London County Council (LCC) as planning authority that it intended to demolish the entire station, including the arch and the Great Hall, which were both Grade II listed buildings. To allow for longer platforms and a much larger station concourse, the station was to be extended southwards over Drummond Street and Euston Square towards Euston Road. This led to an almost two-year long battle to save the Great Hall and the arch. You may have heard of this person. The name sounds unusual. It doesn’t sound English. Is he something to do with music? Is he a painter? If you have anything to do with architecture or historic buildings you will know who he is, or rather was. 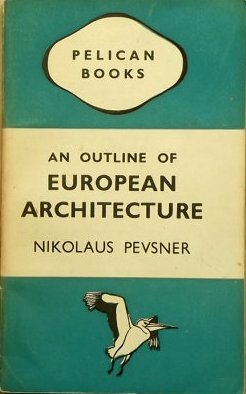 An Outline of European Architecture went into seven editions, was translated into sixteen languages, and sold more than half a million copies. 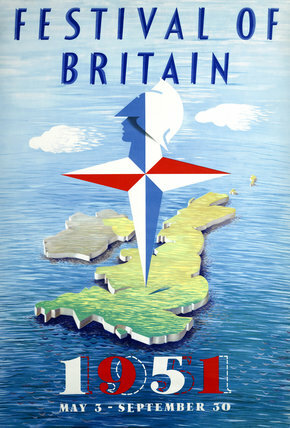 Pevsner was born Leipzig, Saxony in 1902, the son of a Jewish fur importer. In 1933 he was forced out of his teaching post in Göttingen, where he lectured on the history of art and architecture, a result of the ban on Jews being employed by the Nazi state, though earlier he had been an enthusiast of Hitler’s proposals for regenerating Germany economically. He moved to England where he rebuilt his life. By the late 1950s he was a national institution. First published in 1942, Nikolaus Pevsner’s grand tour of Romanesque basilicas, Gothic cathedrals, Renaissance villas and Baroque churches has become a seminal work which has inspired countless students of architecture. 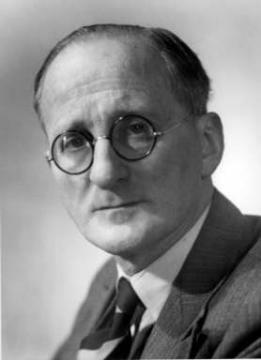 Amongst many distinguished positions, Pevsner was the first professor of art history at Birkbeck, University of London (from where he would eventually retire in 1969); he was acting editor for the Architectural Review between 1943 to 1945, he was Slade professor at Cambridge for a record six years from 1949 to 1955, and he was a founding member in 1957 of the Victorian Society. The unique inventory of English buildings contained in the 20,000 pages and forty-six volumes of The Buildings of England, has been universally acclaimed as a triumph of scholarship, insight and perseverance. Is it said that no student or scholar of architecture would think of touring England today without a ‘Pevsner’ in their hand (perhaps one of a handful of nouns derived from the name of a person). But how did it all start? In England, Pevsner was surprised to find that there was no comparable guide to English architecture along the lines of the invaluable Handbook of German Monuments published by the pioneering architectural historian Georg Dehio who had cycled his way round every important building in Germany. Following an invitation from Allen Lane, founder of Penguin Books, to suggest ideas for future publications, he proposed a series of pocket-sized county guides to be sold at an affordable price. Work began on the series in 1946. Two part-time assistants, both German refugee art historians, were employed by Penguin to prepare notes for Pevsner, working in libraries and amassing a huge file of notes on every place of interest. Then during the Easter and Summer breaks, the only time that Pevsner could afford to take out from his other commitments, he would take off for the next county in his list in an old Wolseley Hornet car often driven by his wife Karola (‘Lola’). 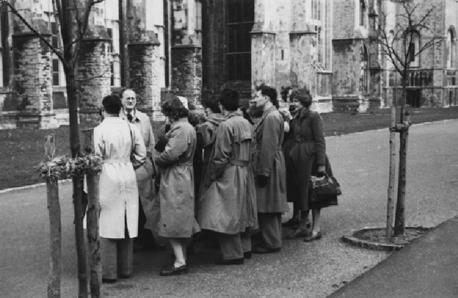 They would drive from dawn until dusk visiting each and every building of historic or architectural interest, usually briefly, with Pevsner scribbling in a notebook. They stayed in hotels, inns and B&Bs, and every evening long into the night, Pevsner would write the first draft at whatever table was to hand. It was a demanding and hectic schedule, a monumental task. 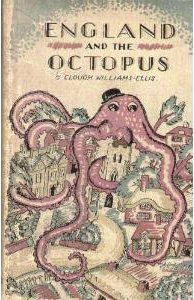 In England and the Octopus, Clough Williams-Ellis warned that the countryside faced sprawl from city suburbs and disfigurement by ‘mean and perky little houses’. Williams-Ellis however held rather dim views about the masses and their aspiration to escape from the slums. He was a Fellow of the British Eugenics Society, and believed that the ‘lower class undesirables’ should be prevented from breeding’. Williams-Ellis designed and built Portmeiron, the Italian style village in North Wales, between 1925 and 1975. The National Trust cares for more than 300 historic houses and gardens, more than 600,000 acres of countryside and 700 miles of coastline, and has more than four million members. But who would guess that the Trust was the beneficiary of a secretive and notorious gang that operated between 1930 and 1940. The gang, however, were neither criminals or revolutionaries, but a group of young, wealthy women with an eccentric sense of humour and a single shared passion. Having read Clough William-Ellis’s book England and the Octopus, published in 1928, which denounced the insensitive building and ugly development that was ruining the country, they determined to do something about it. So the gang was born. The gang operated under pseudonyms, which included Red Biddy, Bill Stickers, Sister Agatha, Erb the Smasher, Kate O’Brien, Silent O’ Moyle, See Me Run, Gerry Boham, Black Maria and The Right Bludy Lord Beershop of the Gladstone Islands and Mercator’s Projection. They invariably wore masks and communicated in mock cockney. Every ‘adventure’ was written up in their own minute book, known as ‘the Boo’. Their first target was Shalford Mill, an 18th century watermill in Surrey that had fallen into disrepair after the First World War. At the time the potential loss of such buildings, which today would be considered national treasures, was considered very much the business of the landowner, and old buildings that were no longer useful were fair game for demolition. In 1932, the gang heard that the mill was facing demolition. They promptly bought the mill and restored it before handing it over anonymously to the National Trust for safe keeping. This was followed by the purchase of Newtown Old Town Hall on the Isle of Wight, stretches of the coastline of Cornwall, Priory Cottages at Steventon in Berkshire (now Oxfordshire), and they supported appeals for money to purchase land in Derbyshire, the Lake District, Devon and Wiltshire, all of which was later donated to the Trust. 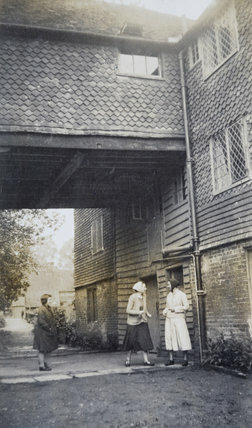 Archive photograph of members of the Ferguson Gang at Shalford Mill, Surrey, with Red Biddy (left), Sister Agatha, the gang’s organiser (middle), and Bill Stickers (right). The Trust subsequently allowed the gang access to parts of Shalford Mill building to hold their clandestine meetings. An ally was The Artichoke, aka John Macgregor, a well-known conservation architect, who became the tenant of the mill. Macgregor’s daughters, Joanna and Penelope, recalled ‘They would just appear, often chauffeur-driven. Our parents would tell us not to stare and to be on our on best behaviour. They were a little in awe of the gang. They were such intelligent women; all tweeds and Lyle stockings. A Fortnum & Mason van would arrive, and cooking smells would permeate our side of the mill’. 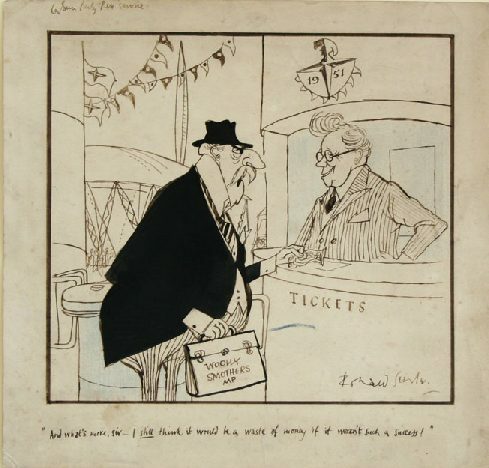 Money was also delivered to the Trust’s secretary at its headquarters in Queen Anne’s Gate in London in a variety of forms under a multiplicity of disguises. On one occasion a cash donation was delivered sewn into the carcass of a goose; on another banknotes were wrapped around miniature liqueurs. During a 1933 ‘raid’ by Red Biddy, a sackful of Victorian coins worth £100 was dumped on the secretary’s desk, with specific instructions for how it should be used. Red Biddy then ‘escaped’ in a taxi that ‘The Nark’ had positioned outside the building ready for the getaway.